This window lets you choose between the different options of creation. 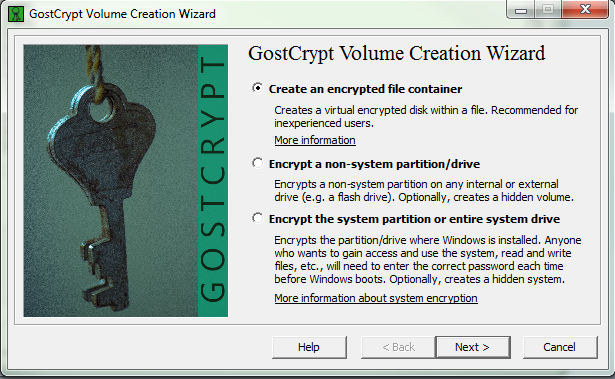 As you may know, on Windows, you can ciphered only an archive, a non-system partition (like a common data partition between two OSes) or the whole system drive (C: by default). We will show you how to do each one. The first option allows you to create only an archive. This one will appear as a normally file, with the .gst extension. 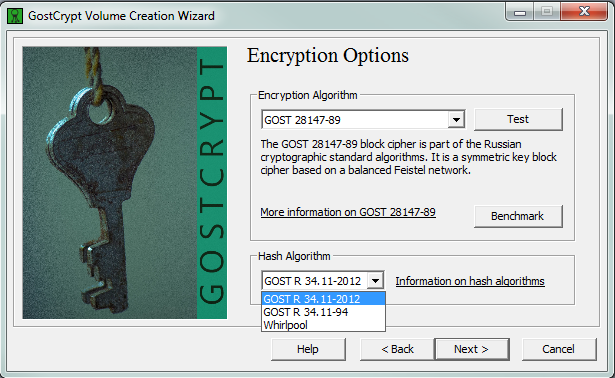 By clicking on it, you will open GostCrypt and will be able to mount it and to use it. But first, let see how to create this archive. There are two options : a standard volume and a hidden volume. The standard volume is defined as written just before but the hidden volume will create a volume in an other one. 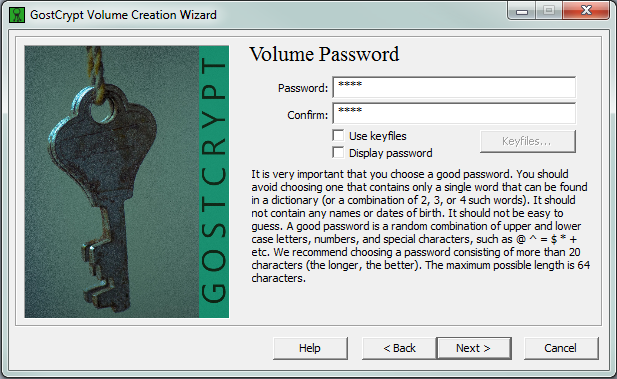 Those two volumes will have different passwords and you will be able to use one or the other, or both. 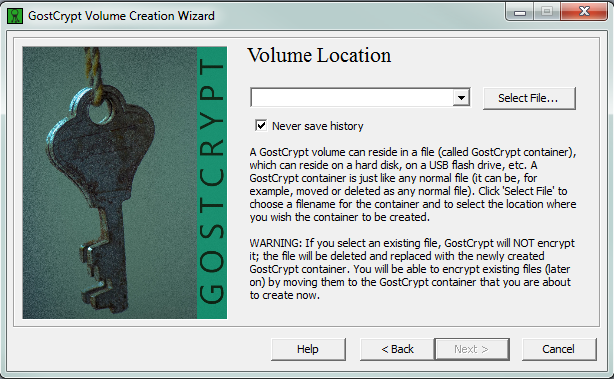 You will choose the Standard GostCrypt Volume option to make it easy. We will now choose where we will create the archive. It is only for the creation, you will be able to put it wherever you want once created. Click on next when it's okay. 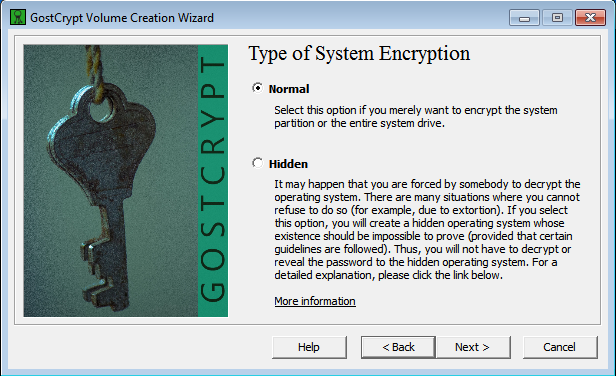 This page is show you the encryption options. On this page, you can choose between the different algorithms. A short information is available for each one. If you don't know what to choose, take the default options. Now, choose the size of the archive you are about to create. 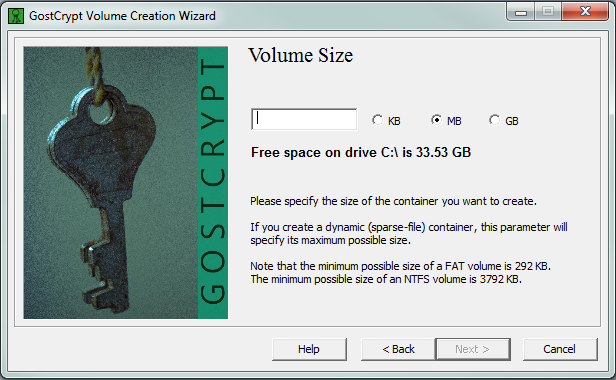 The minimum size of a FAT volume is 292 KB and is 3792KB for a NTFS volume. The maximum is only the size available on your hard drive. This is one of the most important step. You will enter your password here. Be aware that the GOST standards are very strong against attacks, but a short password will be break by a bruteforce attack (test of all possible passwords). The longer your password, the stronger. The best passwords contain letters, figures and symbols. Now, choose the file format for your archive. On Windows, the default format will be NTFS. But if you will use the archive on Linux too, you rather choose FAT. You can now click on format. This can take a lot of time if you want a big archive. 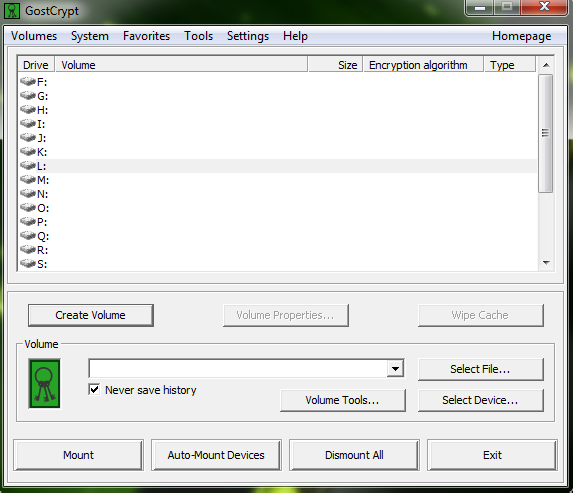 Now we will see how to cipher a partition. This could be very useful if you have two OS on your machine and you share a partition between the two to store your data. 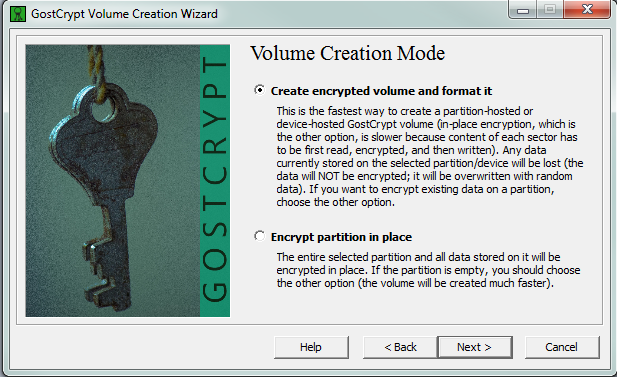 To use this option, we will consider that you have already create the partition you want to cipher. 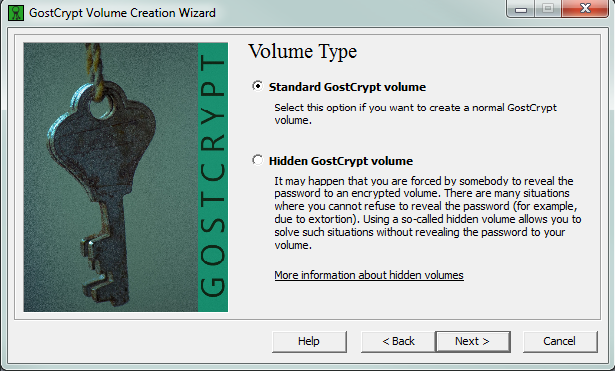 Choose here between a standard GostCrypt Volume and a hidden GostCrypt volume. This window shows you the different partitions of your system. They are divided between each disk (Hard drive, removable drive…). 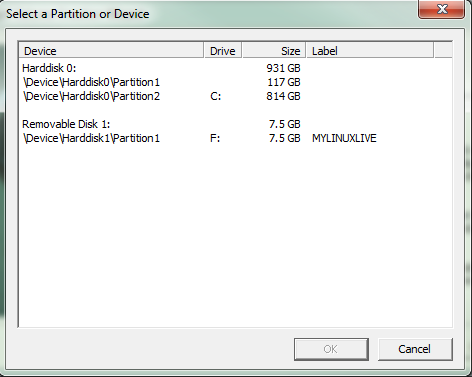 Be careful when you choose your partition. There are only two options. 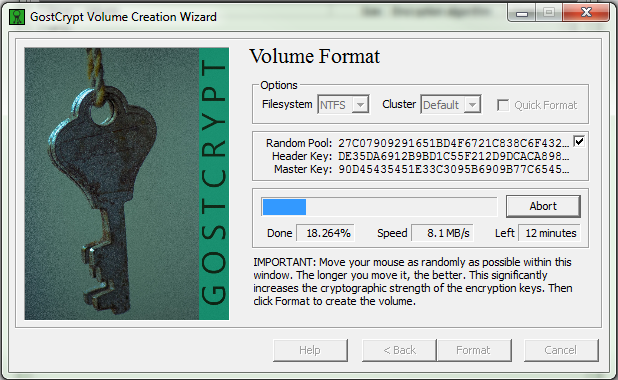 The first one will erase your partition and all its data to create a ciphered partition. The second one will cipher the data and create the archive without erasing your data. It will take much more time. 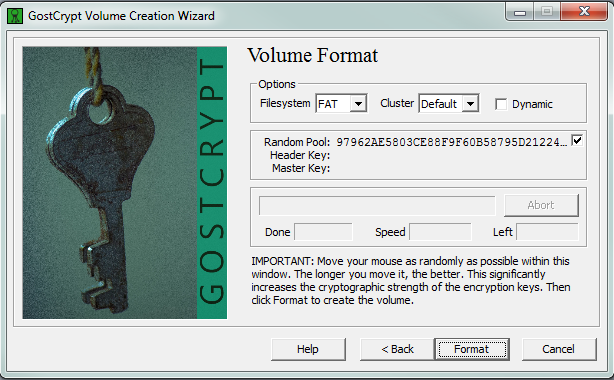 Choose the algorithms you want to use to cipher your partition. This window will tell you the size of the partition you are about to cipher. 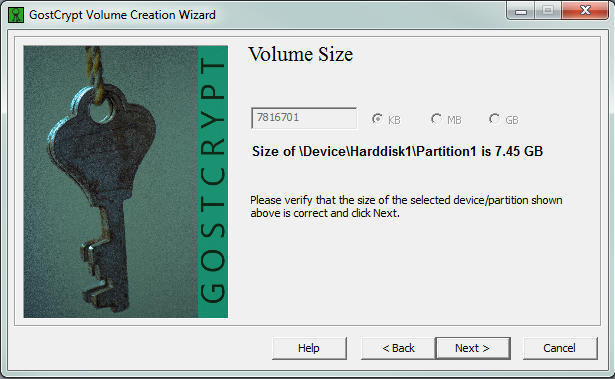 You can't modify the size because it is dependent of the partition. Obviously, you need to choose a password to encrypt your data. Please follow the instructions given in the software or in the first part of this document. The creation wizard asks if you will store files larger than 4GB. This question will impact the choice of the filesystem. Some filesystems don't support files larger than 4GB (like fat32). You can now choose your filesystem (according to your previous choice about the maximum size of the files you will store) and format your partition. This part could be long but it will only be done once. Before the beginning of this part, please do backups of your data.